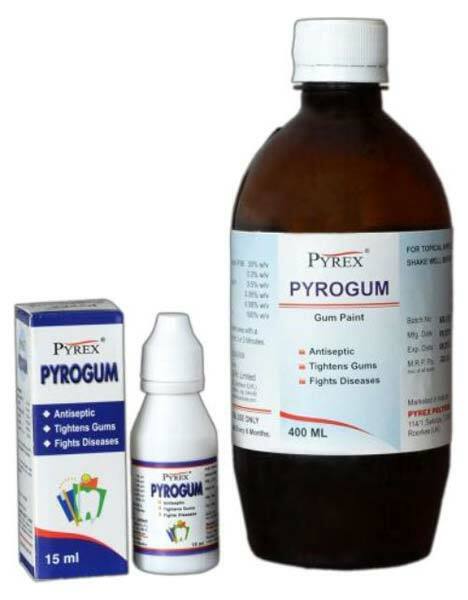 Pyrogum is an antiseptic, astringent, analgesic, deodorant applied on teeth in cases of gingivitis, periodontitis, bleeding & spongy gums, pre-denture problems, pre & post orthodontic treatment tooth extraction, sore throat, ulcer halitosis, etc. Dental Gum Paint Pyrogum that we offer is made from high quality ingredients and confirms to the medical standards. We make available Pyrogum in different packing sizes so as to meet the requirements of the clients. Moreover, it has longer shelf life.